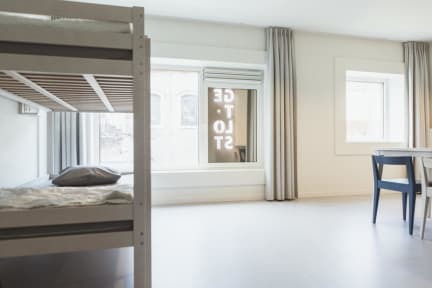 Snuffel Hostel kohteessa Brugge, Belgia: Varaa nyt! The staff was very helpful and the rooms and the toilets & showers were clean, lockers in the rooms were great + free breakfast was good; cereal, bread, eggs, yoghurt. A nice place to spend the night: the staff was very helpful and the atmosphere was nice. There were people mingling in the common area when we arrived, which was cool. The prices at the bar were cheap, which is great considering the quite high prices in Bruges. Also, the complementary breakfast was a huge plus! The con is that the shower smelled awful - I don't know if there's something really off with the plumbing in Bruges, because everything was very clean but still there was an odour.